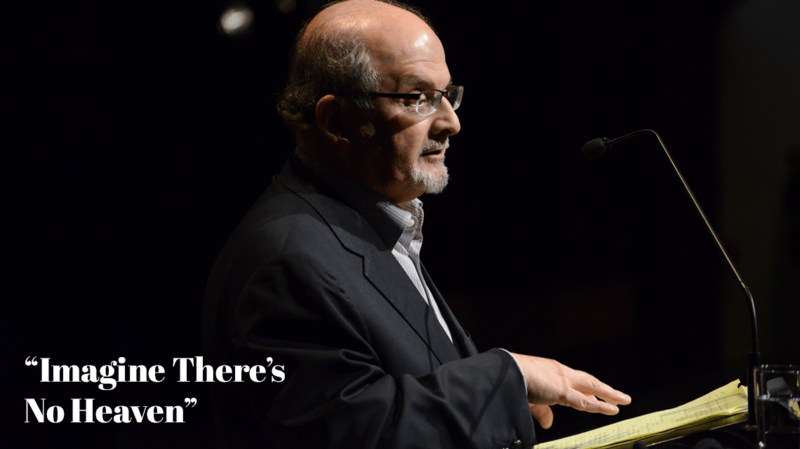 Salman Rushdie, in the article, “Imagine There’s No Heaven”, addresses the problems of the world that happen as a consequence of the dogmas of religion. The authors argues that religion has been the cause of many problems that bedevil the world today through its many doctrines regarding the questions of origin and those of morality. In the article, the author adopts argumentative from absurdity form of rhetorical analysis in which he disapproves the various theories that have been fronted by religion to explain the origin of man, the questions of right and wrong as well as the impact of religion on the world. The author is successful in the use of this approach as he is able to show how misguided and wrong the religious concepts on the origin of the world and everything in it came to be, as well as presenting a compelling argument for the freedom of the mind from all religious dogmas in order for one to be able to understand himself and appreciate life. In the article, the author discusses the various theories on the origin of the world as presented by various religions and concludes that such stories are simply wrong. However, the author argues that the importance attached to these stories has made it impossible to dissuade the vast majority of the world’s population from constructing their lives around religion. The stories have been made in such a way that they become a vital part of an individual’s life, and they are referred to as the heart of culture and a person’s individual identity. According to the author, since the vast of majority of these creation stories encourage procreation, it is the reason why the world has continued to swell with humanity as the sixth billionth person has been born. In summary, the author argues that it is important to answer the question on how we got here, or to read the stories on the same, as this is the single most important aspect of achieving our liberty. The first thing that the author addresses is on the question of origin of mankind. This is premised on the question on how we got into being. It is a simple question that the author asks and proceeds to answer adopting different approaches to arriving at the answers. The question itself is not in reference on how man came to exist, but rather a reference to many problems that confront the world today. The author states that the answer as to the cause of these problems is religion. Religion has come up with certain dogmas that have shaped minds of people, directed their actions and taken control of their liberties. Religion has created stories of origin of mankind, with the belief of a super power god, who brought everything into existence as a result of the immense love he had for everything. These are stories that shape the mind of a person as they grow up and they believe in that religion, and follow it in faith without questioning or thinking outside the doctrines they are given. Therefore, since religion does not believe in things like birth control, it is no wonder, the world population keeps growing, similarly, since religion does not believe in preventive medicine and treatment, many more still die. The author employs a consistent flow in his analysis of the problems that religion has caused on the world. His use of logos is captured in his analysis of the wars brought about by religion. He logically disagrees with the common belief that great wars of the coming centuries will be wars of religion as it has been put across by many people. According to the author, today’s religions are too disjointed to form a common front required in waging war. He gives the example of the Muslim world where the Islamic countries are at war with each other, and thus it is impossible that they will be able to form a common front in any religious wars. This analysis is indeed logical as the reality is that religion today primarily concentrates on the masses that in has influence over. According to the article, this is where war is being fought. It is the war of the godly against the defenseless, wars pitting the American fundamentalists against the pro-choice doctors, the mullahs of Iran against the Jewish minorities, the Hindu fundamentalists in Bombay against the fearful minority Muslims. The author maintains consistency in this analysis, maintaining that religion is the cause of the many problems that exist today. The main point that author is putting across in this point is that religion is responsible for waging war against its own people, against its followers, those who are defenseless. The authors proceeds to provide an analysis on how the war is going to be won, maintaining his objective of writing the article. Moreover, the central goal that is evident in this article is that the author is advocating for the freedom of the mind, the ability to have an open-mind, free from the dogmas of religion. It is this kind of mind that can win the war against religion, as such a mind enhances belief in oneself and is not held captive by the doctrines of religion. Such a mind promotes the trust in the humanity of a human being and not in the superiority a powerful being. Lastly, it does not live by faith, but by the belief of being human and free to think on his/her own unfettered by religion. The second question that the author deals with is that which concerns the aspect of mortality in as far as the determination of what is right or wrong is concerned. The author uses this question to stress the importance of a free mind in the determination of what is wrong or right. He argues against the existence of a divine rule book or judge who has the mandate of stating what is right or wrong as this only serves to curtail the ability of the mind to determine for it itself. To him, the determination of such a question is solely dependent on the willingness of a person to reject religious dogma and be able to reason for himself, without relying on established standards. The question of mortality then relates on how a person should live and such a question can only be answered by that person. The author achieves credibility in his argument of the freedom to choose stating that the concept of freedom is rather fuzzy and difficult to grasp. However, he links this concept to the reliance on personal knowledge which has not be qualified by anything else, as being the only way of achieving freedom from religion. The style adopted by the author is an effective one as he is able to highlight the problems that are caused by religion, succinctly stating the origin of these problems, and providing for the solution of the same. His main goal in the article is that a person should be born free of religious dogmas and stories and be allowed to discover things on his own, including the determination of whether there is heaven or not. Indeed the freedom of the mind is critical in appreciating life as it is the only way a person can enjoy his liberty as a human being. It is important for the audience to view this article in the sense that it is advocating for the freedom of the mind, hence intellectual freedom from religious indoctrination in order to achieve a proper sense of direction. This is important as it will help in solving the many problems that exist today, such as increasing population and high death rates. Rushdie, Salman. Imagine There’s No Heaven. Web. 17 Mar. 2014.